The Galapagos Islands are one of a few places on earth that allow for such intimate contact with a dazzling array of wildlife. Most Galapagos Islands family vacations are cruise-based and carry between 20-100 people. Galapagos Unbound's journey, the only one of its kind, allows a small group of families (12 people) to visit sites that are not on the main tourist routes. Your family will leave the crowds of visitors and well-worn paths behind to enjoy the peace of walking, snorkeling and paddling your way through this island paradise. Galapagos Unbound and parent company ROW Adventure's Galapagos Unbound trip was featured in the New York Times and featured as a "Tour of a Lifetime" from National Geographic Traveler magazine. You will find the article entitled "Galapagos Unbound" by Tim Neville here. So what makes the Galapagos Family Travel Adventure different? On our award-winning Galapagos Unbound Tour, we have specific dates that are exclusively reserved for families! These dates are geared toward families. This has proven, over many years, to help the group dynamic of the trip. We can also match your families ages with other families and create an ideal Galapagos Family vacation! Plus, we have hand-picked guides who are specifically trained in working with little ones. These trips are priced based on the number of guests per trip. Fly into Quito and begin your Galapagos Unbound adventure. Upon arrival, meet with the hotel’s representative and take their private shuttle to your hotel for the evening. After breakfast, venture out to explore Quito. A UNESCO World Heritage Site, Quito offers historic sites such as colonial temples and the monasteries of Santo Domingo and San Francisco. Visit the St. Augustine Convent, the Independence Plaza neighbored by the Jesuit Church of La Compañía, the Municipal Building, the Presidential Palace and the Archbishop’s Palace. Next, we continue our exploration with a visit to the Church of San Francisco, an incredible remnant of the New World known for its elaborate interior. We take a break with some lunch, after which we stop by the Galapagos Unbound headquarters in Ecuador. Tempt your tastebuds with some of Ecuador’s rich chocolate before gathering for a trip briefing and kayaking orientation. Return to your hotel by mid-afternoon and relax before dinner. Depart mainland Ecuador for the Galapagos Islands with a flight from Quito to San Cristóbal. Our Galapagos National Park’s Naturalist Guide greets us upon arrival. Take in San Cristóbal’s eroded volcanic peaks and verdant vegetation as you travel to Puerto Baquerizo Moreno, the provincial capital. Once there, relax with lunch at a local restaurant before getting fitted for your personal snorkel gear which will allow you to experience the Galapagos' marine world in comfort. This afternoon, settle in for your first kayaking expedition of the trip with a 6-mile paddle from Puerto Baquerizo Moreno to Manglecito Beach. The paddle takes you past Lobos Island, where you can spot marine iguanas, blue-footed boobies and brown pelicans perched on the rocky coast. You may even be able to spot passing sea turtles bopping their heads out of water to take a breath or even mating. You arrive to a beach camp welcome from your camp guides, settle in to your tent then either choose to relax and enjoy the view or indulge in more wildlife spotting. This evening, enjoy camping on a secluded beach and relish the freshly prepared food, tranquil views and the occasional visit by the local wildlife before bed. After waking up to the sounds of waves and wildlife, set off on a morning kayak expedition along the coast to Puerto Grande Beach. Upon arrival, settle in and stretch your legs before hopping in a boat for a ride to Kicker Rock, or León Dormido. Look out for dolphins as we travel, and once there set out for an unparalleled snorkeling experience. Sea turtles, Galapagos and white-tipped reef sharks and eagle rays may be enjoying the narrow channel’s calm waters, and you can expect to see light flicking off hundreds of fish and sea stars clinging to the rocks. Return to Manglecito Beach by late afternoon and relax with a beverage and a colorful sunset unobscured against the skyline. *Note: The order of the activities can vary depending on National Park schedules. Early wake up before traveling back to town by boat, no time for breakfast but we will ahve coffee and snacks on the boat. There, catch a flight to Isabela Island—the archipelago’s largest island formed from 6 merged shield volcanoes. Amongst the calderas and lush wetlands, more wild tortoises can be found here than on all the other islands combined, and rare endemic wildlife can be spotted. Despite its soaring volcanic views and impressive wildlife initiatives, few Galapagos cruises make it to Isabela—making this a unique adventure. Our morning travels take us to Puerto Villamil, where we check in at our evening’s accommodations and enjoy some local cuisine at lunch. Up next, we hop in our kayaks and paddle around Isabela's beautiful bay and beachfront. Wildlife is abundant, especially birdlife, and this is probably our best chance to see the tiny Galapagos penguin as they love to hang out and nest on the rocks here. Bring your snorkel gear along as you will have plenty opportunity to jump in and explore beneath the water. The pure white sand on the sea floor makes this a snorkel paradise. Note - the checked baggage allowance for these small planes is 25lbs per person - you may have a carry on like a backpack. If you are over the limit the airline will charge $2 per lb over. Enjoy a fresh breakfast before heading out into Isabela’s highlands for a new view of the Galapagos Islands’ diverse terrain. Our travels take us to the base of Sierra Negra—an active volcano whose last eruption in 2005 left it coated with a remarkable new layer of lava. Hike 6-10 miles to the caldera, the second largest in the world, and enjoy incredible views while looking out for flycatchers, finches and the elusive Galapagos hawk. Once we reach the caldera’s rim, relax and take in the sweeping views of Isabela laying before you. Then, our hike continues to Volcan Chico, where a lunar landscape of fumaroles and rippling snakes of black lava await you. From the highest points, you can see Isabela’s other volcanoes and the surrounding islands. After our hike through Isabela’s heights, return to back to town. Enjoy a stroll along the beach, cool down with a swim or explore more of Puerto Villamil before rejoining for dinner. Delicious BBQ is served outside on the beachfront, giving you an excellent opportunity to relax under a Galapagos sunset warmed by a bonfire. Take a morning boat ride to Los Tuneles, an impressive and unique lava formation comprised of caves and arches dipping in and out of the water. Explore the shoreline and slip on a snorkel mask to explore Los Tuneles’ underwater labyrinth and the Galapagos wildlife that enjoy playing here. From here, we then move to neighboring El Finado, a becalmed inlet once used by local fisherman for respite from their ocean journeys. At El Finado, we anchor our boat and once again hop into the water to snorkel amongst the reefs, submerged caves and marine life wonderland. A favorite haunt of white-tipped reef shark, vibrant tropical fish and stingrays, El Finado offers plenty to see. Further into the lush mangroves, you can discover wrasses, parrotfish and hogfishes navigating alongside you in this unique habitat. After this morning’s snorkel excursions we visit the Tortoise Breeding Center, an initiative by the Galapagos National Park to conserve the many and varied species of these gentle giants. See tortoises at every stage of development and learn about the initiative's work to preserve the species before they are returned to their native habitats. We return to the hotel via the wetlands, where flamingos add a splash of color to the brackish waters of the tidal lagoons that are home to them as well as four species of mangrove and numerous migratory birds. This evening, stroll along the white sandy beach and enjoy a leisurely night independently exploring the town. This morning, we continue our journey along the Galapagos archipelago with a boat ride to Santa Cruz Island. Sitting in the middle of the Galapagos Islands, Santa Cruz also serves as the islands’ social and scientific hub as the Darwin Research Station, the National Park Headquarters and Puerto Ayora—the Galapagos Islands’ largest settlement—all can be found here. Santa Cruz also boasts of a trans-island road, providing rare views of the Galapagos Islands’ lush interior and lofty heights. Our day’s activities take us on Santa Cruz’s highway into the highlands. Here, we stop to visit wild Galapagos giant tortoises. These centenarian, massive creatures can weigh between 200-500 pounds. 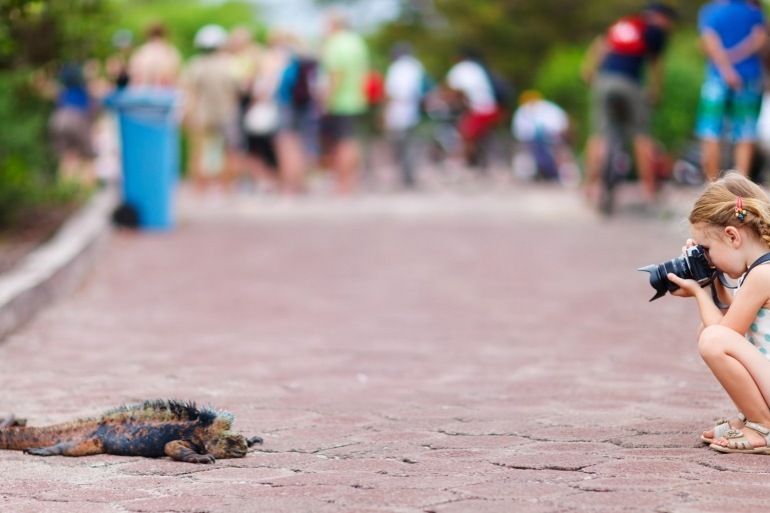 Walk alongside them as they lumber through mud puddles or munch on a snack and discover why they are one of the Galapagos’ most beloved creatures. After, stop by the Santa Cruz lava tunnels—hollow twists that snake through the earth’s crust once formed by hot lava coursing toward the ocean. Step into these tubes and get a unique view at the island’s geologic history. This afternoon, enjoy a leisurely paddle in a calm shallow lagoon where we spend a couple of hours enjoying the tranquility and watching for rays, mullet and sharks along the rocky coastline. *Note: Boat ride from Isabela to Santa Cruz on Shared Services in groups from 4 to 7 people. Activities: Visit the Sugar Mill, relax and kayak on the beach. Wildlife: Darwin’s finches, Vermilion flycatcher, Saclesia and Miconia forest, frigate birds, manta rays, sea turtles. After breakfast, we will take a scenic drive towards El Garrapatero. We will pass through Bellavista town, and have the chance to visit a farm that still processes sugar the old fashioned way. The local property owners produce sugar cane and Galapagos coffee, which they then process both in a very traditional manner. One of the family members, who will act as our guide and informant will demonstrate the farming process of coffee and sugar cane and feature the extraction of the sugar cane juice. We will learn of the distillation process until the final product of “Galapagos Moonshine”, and even more exciting, a look and taste of the fruit of the coffee plant in its natural state. Afterwards, we will continue to the beach of El Garrapatero where we will have the chance to relax on the beach, swim on the ocean or kayak to explore the nearby mangroves. In the evening, at to top of our day, we will have a very special farewell dinner. We are invited by a local angler and his family for a delicious dinner with traditional ingredients and the most enjoyable conversation where we can exchange stories and most importantly, have the opportunity to fully immerse in a new culture. Say goodbye to the Galapagos Islands as you travel to Baltra, where you might catch glimpse of the air base used by the US Navy in WWII. Fly back to Quito, where you may catch your international flight home or continue your Ecuadorian adventure with one of our extension tours. Prices are based on double occupancy. If desired, we will strive to pair you up with another single guest to elimate the single supplement fee however, please note that this is not always possible.